Image Size: 22" x 13.75"
Overall Size: 29" x 13.75"
Task Force Mountain Warrior was formed in May 2009 from a core of the 4th Brigade Combat Team, 4th Infantry Division - the only light infantry brigade assigned to the 4th Infantry Division and Fort Carson and served in Northeast Afghanistan with twelve battalions, four Provincial Reconstruction Teams (PRTs) and 3 Agribusiness Development Teams (ADTs) until June 2010. 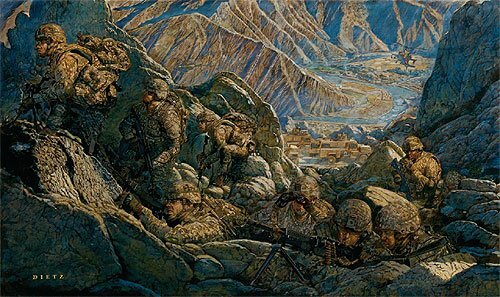 For twelve months, the phenomenal troopers of Mountain Warrior battled Al Qaeda, Taliban, local insurgents and corrupt local governance in the most dangerous, austere and mountainous region of Afghanistan called N2KL (Nuristan, Nangahar, Kunar, and Laghman Provinces) and the volatile Zhari District in Kandahar Province. Training at the "Mountain Post" proved a distinct advantage as the Mountain Warriors were able to train at altitudes between 6,000 and14,000 feet in preparation for their counterinsurgency fight in the mountains of Afghanistan. With a history of deployments to the urban and desert environments of Iraq, the Mountain Warriors were able to use the unique environment in Colorado to arrive in Afghanistan physically fit, experts at their basic combat tasks and trained on specific mountain warfare tasks required for successful counterinsurgency operations in difficult mountainous terrain. The disciplined troopers of Mountain Warrior consistently proved they could "move further and fight harder" than the insurgents they faced. They proved that the precise application of combat power, an understanding of the indigenous culture, a genuine relationship with the local population and a common sense approach to building local governance were critical to mission success. The Mountain Warrior Troopers were feared by their enemies, respected by local Afghans and admired by senior U.S. government leaders for their heroism, individual bravery and outstanding junior leadership. Their tactics and techniques for conducting counterinsurgency operations would become the standard across theatre.